Sometimes the simplest changes can have a big impact. Such is the case with planning prompts, which involve prompting people to plan when they’ll follow through on and engage in a beneficial behavior. The reason that planning prompts work whether people make them privately or publicly is the desire for humans to remain consistent with their commitments (i.e. to stick to their commitments). Think about when, during a political campaign, one politician running against another accuses his or her opponent of “flip-flopping.” The accused typically denies flip-flopping. The media jump all over this development in a political campaign and unwittingly pour gas on the fire by looking for evidence that the accused politician has changed her or his mind “as the political winds blow,” even in the face of evidence that should have led to a change in position. The good news is the need for people to be consistent with their commitments can be leveraged for good as well as ill, especially when commitments are made public. This small change has been used successfully in contexts as different as doctors’ offices and hotels. Patients asked by healthcare staff to write down the date and time of their next appointment on an appointment card, rather than the healthcare staff filling out the card, and hotel guests asked by hotel staff at check-in to commit to reusing their towels, and then given a badge indicating that commitment, have increased appointment show rates and reuse of towels, respectively.3 The public aspect of these commitments is when patients and customers make them in front of staff. If you run group interactions, have the dads fill out the reminder cards in front of other dads to make their commitment public. To increase the likelihood that dads will maintain their commitment to attend the next interaction, assign dads to pairs of “accountability partners” in which the dads in each pair call each another ahead of the next interaction to remind each other to attend. If you run group interaction, create a catchy pledge of commitment to attend that the dads recite at the end of each interaction. Just a few sentences should do. Reciting such a pledge will make each dad’s commitment public. Regardless of how you apply the knowledge of planning prompts, approach your effort as an experiment. Keep track of what works with fathers in general and with specific kinds of fathers (e.g. custodial and non-custodial) so that you can apply what works in future work with fathers one-on-one or in groups, and avoid what doesn’t work. The book The Small B!G: Small Changes that Spark Big Influence by Steve Martin, Noah Goldstein, and Robert Cialdini. The book Yes! : 50 Secrets from the Science of Persuasion by Noah Goldstein, Steve Martin, and Robert Cialdini. 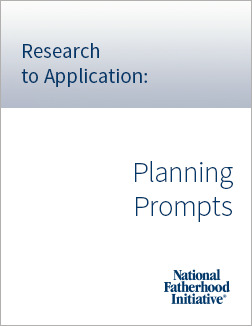 The series offers a platform for generating dialogue among NFI, organizations, and practitioners on ways that research can be applied to addressing pain points in serving fathers. This post is the seventh one in the series. It provides ideas on how you might integrate research on planning prompts. Integrating this research could make you more effective in your work with fathers (e.g. facilitating a fatherhood program or working with fathers one-on-one).